If you know men's suit fashions, then you know about Tony Blake. Tony Blake men's dress suits are made with the latest fabrics and styles using old fashioned hand finishing that look good with Stacy Adams Shoes. You can't go wrong adding Tony Blake suits to your fashion wardrobe. You will find that if you like suits that holler back to a bygone era, the type of suits that seem almost like they came from a time machine representing suit style from the 1920s, 1930s and 1940s, Tony Blake should be a design label on your online shopping list. 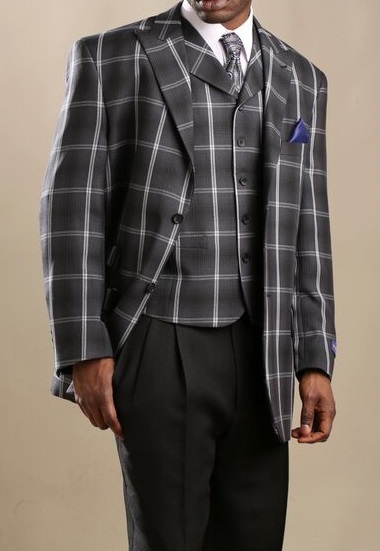 You'll find suits that are made of fancy style pattern fabrics all engineered with the goal of getting you noticed combined with fancy style vests that just add that certain something that truly makes the whole suit come alive. Feel Free to shop online at ContempoSuits.com for Zoot Suits Need a Tuxedo that is all about style or Dinner Jacket. You should also check out our huge selection of affordable priced Mens Suits. Shop Urban Fashion Suits Here. Get your gator fix going with Real Crocodile Shoes by Belvedere Shoes.